this poem is a poem i wrote recently about the monotony of life and how a man goes on a changing journey when he encounters love. Sitting at a table in the middle of the high school cafeteria. People around me talking about who the hottest girl in class was. They all spouted names of girls they thought to be the fairest of them all. I sat there eating my grilled chicken sandwich in silence. Endless rows of blue and black. Surrounded by an auditorium of people watching from the stands. The announcer half-heartedly speaking words of family and unity. Calling each prototype one by one to the stage. My name was called, not once, not twice, but three times. The professor speaking of architecture. Yet had failed at becoming an architect. Theories, processes, laws, regulations, clauses, clues, etc. They were all the same, useless. I sat there with cold stone eyes staring down at the many students below. Wondering if they could ever understand. A girl sat there, all alone, at the foot of the stairs to the main library. The day had ended and the night had begun. It was winter and the snow had begun to conquer the land below. She wore no coat but looked so warm under the light post. Watching the snow fall lightly with a smile. Her green eyes focused without a care in the world. The dandelions blossomed as spring covered the winter's shift. There I saw her again sitting next to the old oak tree. I lost control of my body and made my way to where she was. Sitting next to her all we did was enjoy the silence. The sun got hotter as the days got longer. Yet somehow I felt ok with that. I sat there in my suit and tie in that nine by nine jail cell. An infinite amount of spreadsheets on my screen, but my mind was elsewhere. Thinking back to that time I sat next to that mysterious girl by that old oak tree. Every day during the fall she would sit next to that old oak tree. And that would be our great retreat. We'd sit and watch the sun set and rise and tell stories of a time that never came. For the first time in a long time I smiled. I don’t know why I smiled. The winter returned and the flowers began to wither. I walked in the blistering cold to reach that old oak tree. My heart pounded like many times before. The closer I got the harder I felt it. I sat next to that old oak tree and waited for hours. 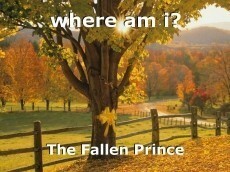 © Copyright 2019 The Fallen Prince. All rights reserved.